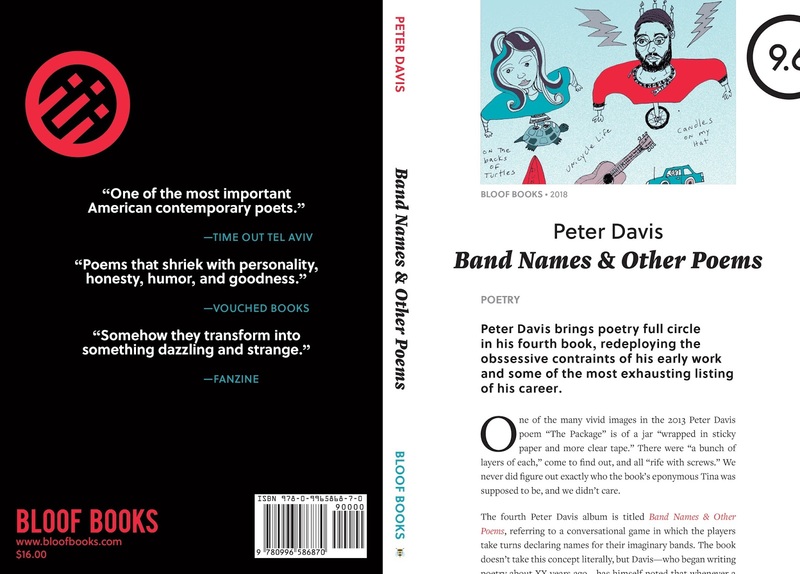 The fourth book of poems by Peter Davis, Band Names & Other Poems. Preorders ship in February, exclusively from Bloof Books. Retailers will begin stocking the book in mid-March. In Poetry! Poetry! Poetry!, Peter Davis asked himself, "What would happen if poets told the whole truth about themselves and their artistic ambitions? What if every poem were stripped down to radical honesty?” In TINA he asked, "What would happen if every poem were addressed to the same person, someone not exactly a beloved?" This time around, Davis started not with a question but a dare as his constraint: create an endless list of band names, each plausible, spanning a variety of musical styles and eras, without exhausting the concept. BAND NAMES & OTHER POEMS is the result of that experiment, the Oulipo-inflected descendent of Raymond Queneau’s 100,000,000,000,000 Poems, sort of, but funnier and about bands. Turns out, naming bands is a peculiar linguistic activity—they’ve got their own grammar, and a flexible form that’s as ready to satirize current events as to indulge in a really bad pun. Readers will soon find themselves visualizing and even hearing the bands: understanding how Shock Fawn differs from The Stitch Release, why Stations of the Crossbow could never share a bill with Trauma Rasta or Gretchen Retch, while Midnight in Fairy Tales opening for Paper Kate makes total sense. When Trump Wall and the Mexico Pays does a contemporary-country cover of “Foreign Scandal” by 80s punk legends Reagan’s Assassination the crowd goes unwittingly wild. 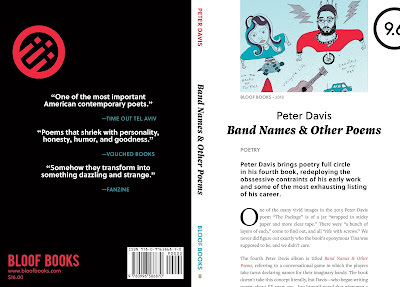 PETER DAVIS's previous books of poetry are Hitler’s Mustache, Poetry! Poetry! Poetry!, and TINA. He writes, draws, and makes music in Muncie, Indiana, where he lives with his wife and kids and teaches at Ball State University. For more information visit artisnecessary.com. Poems from this new book have appeared in Ampersand; the Awl; the Believer; Big Bell; Columbia Poetry Review; Forklift, Ohio; Masque and Spectacle; interrupture; Juked; Omniverse; Open Letters Monthly; Poet Lore; Powder Keg; Rhino; and Sixth Finch. in my chest is a fur grenade.